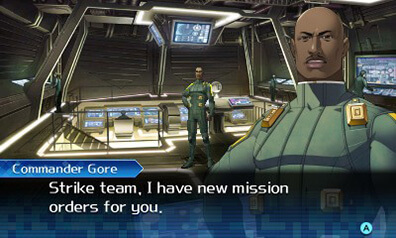 Shin Megami Tensei: Strange Journey released on the Nintendo DS back in 2010. 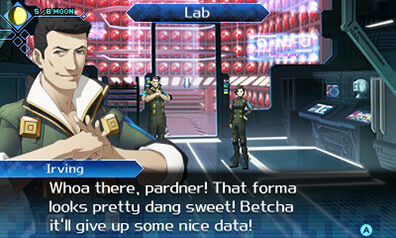 Strange Journey is often argued to be one of the best games in the SMT series due to its story, gameplay and atmosphere. So now almost a decade later, and as part of the 25th Anniversary initiative, Atlus has remade the game for the 3DS as Shin Megami Tensei: Strange Journey Redux with completely overhauled re-drawn art, more demons to recruit, an entire new character arc and new dungeons to explore. So how did this remake turn out? Was it best left in the past? Or has it become a strange turn of events? Shin Megami Tensei: Strange Journey Redux’s story for the most part is similar to that of the original DS release. A strange force has opened up in the arctic that has been named Schwarzwelt. You and a special task force are sent in to investigate the Schwarzwelt to discover its origins and see if you can prevent it from swallowing the entire planet. The story itself is honestly very engaging and kept me on the edge of my seat the entire time throughout the game. The more I discovered about Schwarzwelt, the more I wanted to know about the world surrounding it. The atmosphere of this game also added a lot to the storytelling, thanks to the eerie and creepy vibe that follows you the whole way, like something is just looming around the next corner. 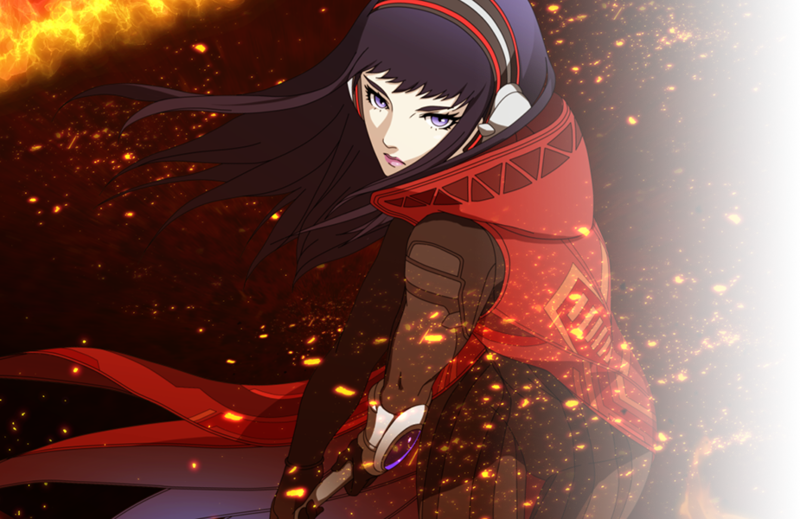 This game’s story is probably the most I have ever been engaged in when playing a Shin Megami Tensei game. 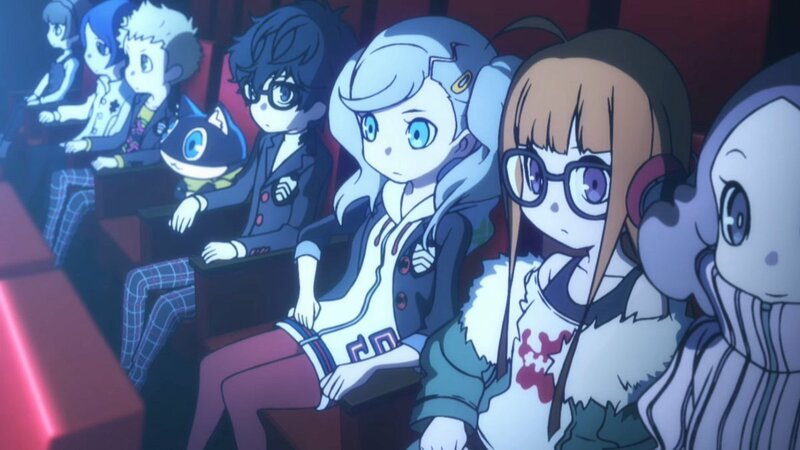 All of the characters felt full of life and the voice acting added a lot to the performance. There is also an entire new story arc in this game centered around the mysterious character Alex. Her story for the most part is pretty interesting, but I won’t go into it as to avoid spoilers. It should also be mentioned that, like any Shin Megami Tensei game, there is an alignment system; during the story, you have the option to make certain choices, which will determine your alignment, and the way demons will interact with you. Which can make negotiating with some demons more of a pain, as demons who are towards one alignment may not be as eager to talk to you if you are in another. 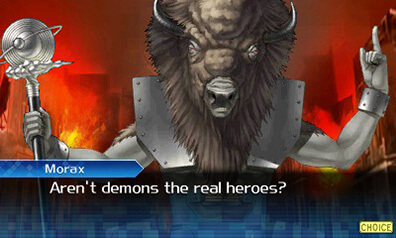 The gameplay for SMT Redux is not that of your typical SMT game. SMT Redux plays as a DRPG as opposed to a normal JRPG, so be prepared for a lot of first person dungeon crawling. 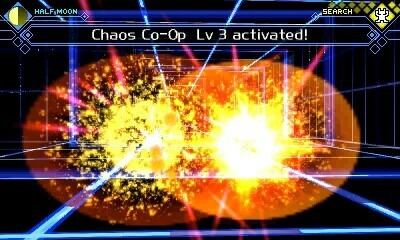 Schwarzwelt is broken up into several different dungeons with their own themes. You can go from a war torn battlefield to a red light district in Tokyo; this place is truly unpredictable. What sets each dungeon apart from each other gameplay wise is that there are many puzzles in each one. Whether its navigating boobytrapped tiles, or moving tiles that can send you around the floor, there are many things to keep you on your toes. While the dungeon crawling may be different from other SMT games, the combat pretty much remains the same. You still recruit and fuse demons to join your party and the combat is as fun as ever. It is your standard turn based fair, with you controlling yourself and each demon in your party. With the many different demon types, there are infinite ways for you to build up your team, but team composition may be more important in this game than others. Unlike previous SMT entries, Strange Journey Redux does not use the traditional press system, but instead uses an alignment combo system. As mentioned earlier, SMT games are known for their alignments you can take, and if a demon attacks an enemies weak spot, then every party member with the same alignment will follow up for additional damage. While on the surface this can lead to some pretty cool combos, it doesn’t feel as fleshed out as the press system. It also can make creating team compositions a bit odd, as depending on the story alignment you are going for, you may have to build your team accordingly to get the most out of it. All of that said, once you get the hang of it, it is really cool using it to your advantage against the enemy. In this remake of the game, there are quite a lot of things added that makes the game’s quality of life all the better. New to this game is the ability to have field saves. SMT games are known for their harsh, yet fair, difficulties, and a gameover can be around any corner if you’re not careful; the ability to save anywhere is a nice safety blanket if you feel like you are about to enter a dangerous situation. Alongside of the new character route with Alex, you also get access to an entire new dungeon that centers around her. This dungeon is very expansive, with its own side plot alongside the main story. You can return here for some extra grinding and finding certain demons. 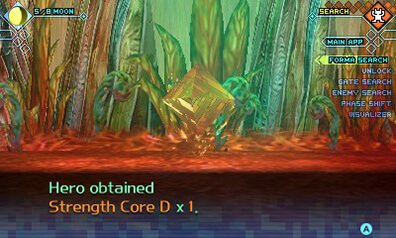 Completing each floor’s boss also gives you access to some pretty powerful special fusions as well. This dungeon in and of itself felt like an entire Schwarzwelt with how big it was. It should also be noted that your actions here will also determine which additional ending you get in Alex’s storyline. Other changes to the game include new art, dynamic story scenes and new background scenery, alongside of the game being fully voiced. It should be mentioned that this game only has a Japanese dub, but the Japanese voice acting is spectacular, and (as stated earlier,) adds quite a bit to the game’s atmosphere. The changes end up giving the game a nice fresh coat of paint, and looks a lot sharper compared to its DS counterpart. Additionally, for those of you looking for a real challenge after completing the game, try your hand at the impossible game mode. Also the game has three new endings alongside the traditional three endings, so there is plenty to keep you coming back for more. One last thing I should mention is the game’s soundtrack. I honestly don’t know why, but the music in this game really stood out to me. Instead of the retro and techy style music from other SMT games, this game opts for a more orchestrated score, and it really fits the games theme incredibly well. The music made a lot of the boss fights and even more tense moments in the story all the more powerful to go through, which went a long way in cementing my immersion. Pokemon Sun and Moon revamped the structure of the series by doing away with the traditional gym challenge, and replacing it with the island challenge. The island challenge is a much more personal journey, where the player travels across Alola to clear trials from seven captains, and become the island challenge champion. Where this differs from gyms, is what you’re doing in each trial. Some trials involve defeating wild Pokemon to advance, solving puzzles, or even a simple memory game. At the end of each trial is a fearsome Totem Pokemon. A gargantuan version of a Pokemon that is related to that island. After every trial on an island is completed you fight the Kahuna, the strongest trainer on the Island. As a new trainer in the Alola region, can you conquer the Island challenge? At the most recent Nintendo Direct, it was announced that Atlus USA would be bringing the most recent FURYU 3DS JRPG The Alliance Alive to the west. A spiritual successor of sorts to The Legend of Legacy. It’s time to resist! Humanity must band together and unite against Daemon oppressors because ATLUS is bringing FURYU Corporation’s JRPG The Alliance Alive to the Americas and Europe for Nintendo 3DS! The game was originally released in Japan earlier this year and features nostalgic gameplay developed with a modern touch. Featuring massive world-exploration, an intertwining story of nine protagonists, an exhilarating turn-based battle system, and more, JRPG fans will instantly feel at home when crusading against evil in The Alliance Alive. The Alliance Alive will be launching physically and digitally in the Americas for $39.99, while only being released digitally in Europe. This morning Atlus USA has announced that Etrian Odyssey V will launch on October 17th in North America. No word on when Deep Silver will publish the game in Europe. Hopefully we will get some information soon on a European release! In the meantime check out the latest trailer for Etrian Odyssey V explaining the Fencer class! 24-Page Art Book – Beautiful character art and concept sketches by the illustrious Yuji Himukai cover the pages of this magnificent art book. The unique explorers that will fill up your party are a wonder to behold. 6-Track Music CD – A grand journey is utterly droll without music, so get into the adventuring mindset with an enchanting soundtrack crafted by long-time series composer Yuzo Koshiro! Outer Box – The Yggdrasil and eager adventurers adorn this colorful out box which protects the precious treasures it holds within. This is also looking to be one of the few Atlus launch editions that dosen’t seem to include the infamous “Atlus Tax”, you will be able to pick this up this Fall for $39.99. Atlus USA will also be streaming some Etrian Odyssey V on their twitch. channel to celebrate the series 10th Anniversary on July 28th at 6:00pm EST. In the mean time you can check out the newest trailer for the game. Atlus today has shown off the cover art for Shin Megami Tensei Deep Strange Journey (or Strange Journey Redux in the US) in the most recent issue of Famitsu. You can get your hands on this thing for the low price of 16,800 Yen. This edition launches in Japan on October 26th. Sadly there is no news on whether or not western fans will be able to get their hands on this 25th Anniversary edition in the western release next year. Fingers crossed that Atlus will give us something to celebrate! Thank You Nintendo for Providing a Review Copy of this game. “Super Mario Maker 3DS” is the latest Wii U game that Nintendo is bringing to the 3DS. The game touts itself as being a fun Mario Maker experience, but on the go. So, how does this portable version of the game stand up to the critically acclaimed 2015 Wii U title? All I can really say is that it is lacking, in more ways than one. Super Mario Maker 3DS’s gameplay is very similar to that of the Wii U, but instead of using the Wii U gamepad to create the levels, you instead use the touch screen on the 3DS to drag and drop things to create the levels. While it may be harder to create intricate designs compared to the Wii U gamepad because of the size of the 3DS, it still gets the job done. Similar to the Wii U version of the game, you have to be able to complete your levels before you can share them. The gameplay mechanics are as smooth as ever when going through your own Frankenstein creations of levels, and the limits to what you can create are still boiled down to what your imagination can think of. With the ability to take this game on the go now, it’s extremely easy to pick up and play this game to scratch your creative itch. Visually, Super Mario Maker 3DS is alright. The 2D Mario themes are all really good and transitioned well onto the 3DS; it’s when you get to the New Super Mario Bros content the issues arise. The “New Super Mario Bros” style really doesn’t transition well to the 3DS. I honestly suggest creating levels with any of the other 2D elements, as the 3D ones are just jarring. However, while the game does indeed have a lot of good things going for it, it has a lot of things holding it back. The biggest issue with this is the lack of content compared to the Wii U version of this game. The more major difference being that you are unable to upload your levels onto the online database of other levels, instead the game opts to share your creations with others around you through Streetpass. While the Streetpass features are cool, as they allow your friends to help finish levels you haven’t finished creating, it feels like without the online capabilities of the game, it misses the entire point of what made the Wii U version of the game so great. The ability to upload my levels onto the internet and see several people play my levels was the main reason why I continued to play Super Mario Maker; I took feedback from players and used it to create better ones. With that reason, and few people around me actually owning this game to Streetpass with, I grew bored of this game after a few hours. Sticking to the theme of the games content, while the game does have a ton of premade levels for you to go through, and still has the Mario challenges in it, the game just feels completely lacking when there is a more complete superior version, with Amiibo support, on the Wii U. It just baffles me that so much content was ripped from this game, that it feels like a shell of its former self. You do not have the ability to download levels either that you play, nor can you favorite or rate them. This was really disappointing as I managed to play quite a few good levels that I wanted to favorite, or come back and finish later, but due to the nature of this game I was unable to. At the end of the day, Super Mario Maker 3DS excels at the level editing the Wii U game was known for. Sadly, that was only a fraction of the full Wii U package. While the game does boast to have a hundred built in levels, I feel like that they should have just taken those and repacked the game as New Super Mario Bros 3, as the sheer lack of online functionalities makes this game very hard to recommend. If you can still find a Wii U, or already have one and are debating on whether or not you should pick up this game, I would say just get it on Wii U. The game must have been reviewed on our site. The game must have come out this year. Well that’s really it! Since it’s our first Game of the Year Awards we have a bit of growing pains to work with but we hope to do this every year! So let’s start out with the individual categories!